TSN hits the rink for the 2017-18 NHL season with an expanded slate of 191 regular season regional games available to subscribers in each team’s market throughout the season. TSN’s regional hockey lineup features the newly acquired Montreal Canadiens with a package of 50 games on TSN2, 26 Toronto Maple Leafs games on TSN4, 55 Ottawa Senators games on TSN5, and 60 Winnipeg Jets games on TSN3, with comprehensive news and analysis from TSN’s industry-leading suite of Hockey Insiders, analysts, and reporters available across SPORTSCENTRE, TSN Digital, and Radio platforms throughout the season. TSN Radio stations across the country also provide listeners with pre-game, post-game, and live game coverage, as well as extensive analysis. Led by TSN Hockey host James Duthie, the TSN Hockey Insiders Bob McKenzie, Darren Dreger, and Pierre LeBrun contribute to each team’s regional broadcast coverage, and provide in-depth analysis and discussion across TSN Digital and Radio properties throughout the season. 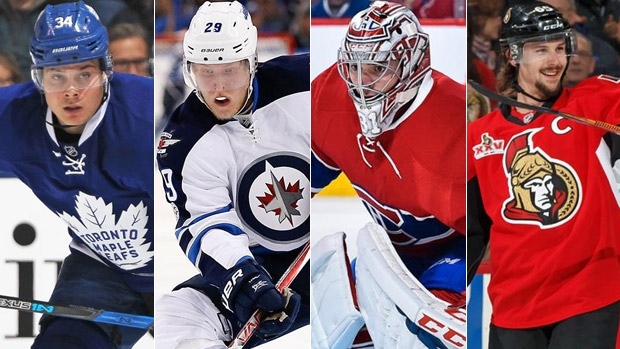 SPORTSCENTRE Bureau Reporters across Canada also deliver news and reports across TSN’s various programs and platforms, including John Lu in Montréal, Brent Wallace in Ottawa, Mark Masters in Toronto, and Sara Orlesky in Winnipeg. TSN’s package of newly acquired Montreal Canadiens games is led by the HABS ON TSN broadcast team of hosts Tessa Bonhomme, an Olympic gold medallist and two-time IIHF World Champion, alongside veteran broadcaster Glenn Schiller, with play-by-play announcer John Bartlett, reporter John Lu and analysis from Dave Poulin, Mike Johnson, and Craig Button. As the team’s official English-language radio broadcaster, TSN 690 in Montreal provides live coverage of all pre-season, regular season, and playoff games, featuring play-by-play announcer Dan Robertson and commentator Sergio Momesso. TSN 690 also has pre-game, intermission, and post-game coverage for all games throughout the season. Fans can continue to turn to the station for extensive Habs discussion throughout the day as well as industry-leading analysis from TSN Hockey Insiders, with contributions from Pierre McGuire, Ray Ferraro, and more. TSN’s Leafs broadcasts are led by the all-star TSN Hockey panel, featuring host James Duthie and Hockey Insider Bob McKenzie alongside analysts Jeff O’Neill and Dave Poulin. MOLSON CANADIAN LEAFS HOCKEY ON TSN coverage features the network’s award-winning broadcast team of play-by-play announcers Chris Cuthbert and Gord Miller alongside analysts Ray Ferraro and Jamie McLennan. As the team’s official radio broadcaster, TSN Radio 1050 in Toronto delivers live coverage of Maple Leafs games throughout the season, led by play-by-play announcer Joe Bowen and analyst Jim Ralph, plus pre-game, intermission, and post-game coverage with hosts Jim Tatti and Greg Gilbert. TSN 1050 Leafs reporter Kristen Shilton follows the Leafs all season, delivering daily updates for TSN 1050 and TSN Digital platforms. Additionally, with host Andi Petrillo and a roster of co-hosts including Mike Johnson, Poulin, Dreger, Miller, and Gilbert, the fan-favourite LEAFS LUNCH returns weekdays from 11 a.m. to 1 p.m. ET. Fans can also tune in to OVERDRIVE WITH HAYES, NOODLES AND THE O’DOG weekdays from 4 – 7 p.m. ET, with hosts Bryan Hayes, Jamie McLennan, and Jeff O’Neill tackling the NHL from an informative and humorous perspective. TSN’s package of Sens games is led by TSN Hockey’s panel of host James Duthieand Hockey Insiders Darren Dreger and Bob McKenzie, alongside analysts Craig Button, Dave Poulin, Mike Johnson, and Aaron Ward. CANADIAN TIRE SENATORS HOCKEY ON TSN features award-winning play-by-play announcers Gord Miller and Chris Cuthbert with analysts Ray Ferraro and Jamie McLennan and Mike Johnson. As the team’s official radio broadcaster, TSN Radio 1200 in Ottawa has live coverage of every Sens games, featuring play-by-play announcer Dean Brown and analyst Gord Wilson. TSN 1200 also features pre-game, intermission, and post-game coverage with TSN Hockey Insider Bob McKenzie, hosts Ian Mendes and Lee Versage, and analysts Todd White, Shawn Simpson, Brendan Bell, Brad Smyth, and Chris Stevenson. Fans can also turn to the station for extensive Sens talk throughout the day, including TGOR in the morning with John Rodenburg and Steve Warne; IN THE BOX with Steve Lloyd and Todd White; and THE DRIVE in the afternoon with Ian Mendes and Shawn Simpson. Helming the booth for the 2017-18 season is the JETS ON TSN broadcast team of veteran play-by-play commentator and Manitoba native Dennis Beyak alongside Ray Ferraro, Jamie McLennan, Dave Poulin, and select analysts, as well as SPORTSCENTRE Winnipeg Bureau Reporter Sara Orlesky. As the team’s official radio broadcaster, TSN Radio 1290 in Winnipeg continues to bring fans live coverage of every Jets game. Play-by-play commentating duties will be shared by Dennis Beyak and Paul Edmonds, who are joined by Brian Munz, a part of TSN 1290’s Jets coverage since it debuted in 2011. Fans can also tune in for extensive pre-game, intermission, and post-game analysis and coverage featuring host Kevin Olszewski alongside former NHL players and TSN 1290 analysts Trevor Kidd and JP Vigier. Live streaming of TSN’s regional NHL coverage is available to TSN subscribers via TSN.ca/Live and the TSN GO app. Radio coverage is available via each station’s website as well as the TSN GO and iHeartRadio apps. TSN’s regional hockey coverage is available to viewers in each team’s broadcast region, which is determined by the NHL.